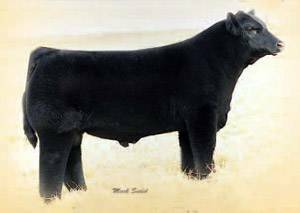 Shelby is without question one of the best maternal Maine/Simm/Angus bulls on display in Denver. Admired by the nation's top producers for his skeletal correctness, massive bone and hoof size along with his extreme depth of body. Shelby possess that overall soft easy-feeding look that everyone is after today.